Aside from baking, Christmastime has become crafty time for me in recent years. I've found some fun projects in the past to make easy DIY gifts. This year, I looked to Pinterest to find my DIY project and was happy to find one that incorporated a new hobby of mine (stamp carving) into the craft. 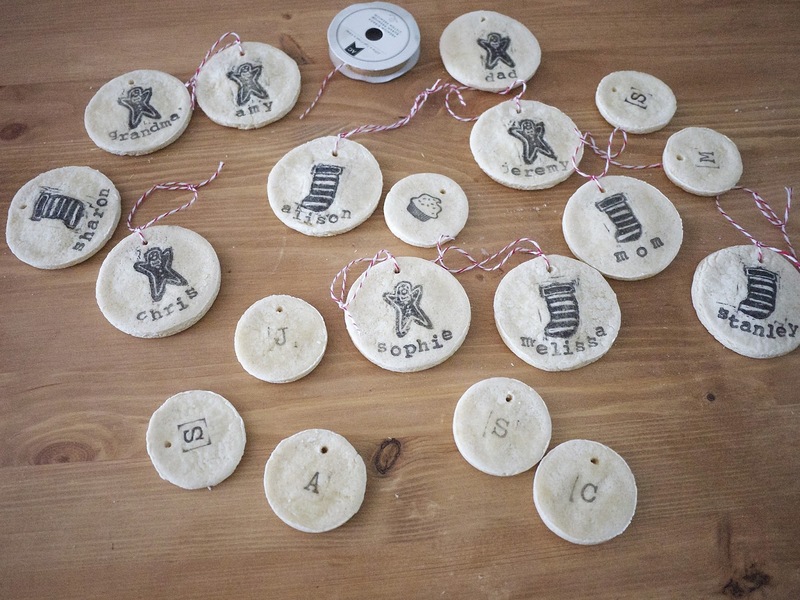 Salt dough ornaments: These are a tradition for many families and I have a vague memory of making them in preschool. They're personalized, simple and very low key. And any time I get to use my rubber stamps and bakers twine makes me super happy. And if you're extra ambitious, check out this stamp carving kit from the Yellow Owl Workshop. I used to carve stamps in art class in junior high so I felt right at home using this kit. Just keep your fingers away from the blade and then you're good to go! The stamp kit comes with the cutest shapes to trace (I carved the gingerbread man and the stocking above). As an extra holiday treat, play this Swinging Christmas playlist while crafting/holiday baking/trimming the tree/etc. This playlist has been an ongoing project for the past decade. It usually plays nonstop from Thanksgiving until Christmas Day in my car/apartment/iPod. It's been a labor of love and I'm glad I found a platform to share it with you. (Sorry to the non-Spotify users). 1. Preheat oven to 250 degrees. Combine flour, salt and water in a stand mixer and mix until well combined. Remove dough from bowl and place on parchment paper. Knead until soft. May need to flour parchment paper if dough is too sticky. 2. Roll dough with rolling pin until 1/2 inch thick. Cut out circles of choice with appropriate sized cookie cutters or cups. 3. Stamp dough with rubber stamp of choice. Be sure to be gentle so you do not imprint the dough with the stamp. (Merely press the stamp gently into dough to transfer inked shape onto surface). 4. Poke a small circle using a screwdriver near the top part of the ornament (just poke and twist screwdriver until a small circle is formed). 5. Transfer parchment paper to baking sheet. Bake for at least 2 hours. 6. Cool ornaments. After cooled, cut off strips of twine and tie into a circle onto ornament. 7. Use as a gift tag or gift them to your loved ones.